The FCV is a stainless steel, NACE compliant simple device combining a check and needle valve to accomplish speed control in pneumatic actuators and cylinders. 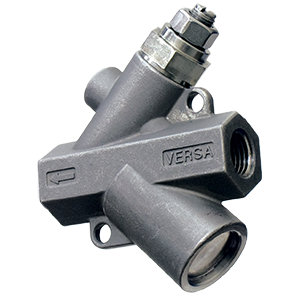 Versa’s Flow Control Valve (FCV) is a stainless steel, NACE compliant simple device combining a check and needle valve to accomplish speed control in pneumatic actuators and cylinders. The key to Versa’s full flow is the internal design and the Versa “shuttle.” This combination provides a larger surface area and yields higher flows than controls utilizing ball checks. When the flow is reversed, placing pressure on the “shuttle,” it rapidly opens to a high flow orifice that instantly, empties the volume in the line. Flow adjustment is controlled by Versa’s proven needle design from our “Bleed Control” family of products. Versa’s needles are designed for full adjustability throughout the control range. The unique internal design provides an exceptional linear flow curve, each % of the needle turn provides an equivalent % of flow change. No dead zones!